I find myself these days full of feelings of dissent and resistance but looking for more whimsical ways to express the same, as you can’t be strident all the time. It’s boring, and exhausting. So a flashing reference caught my attention, to a dinner party in Baltimore in February of 1777 attended by two of the most strident people in history: John and Samuel Adams of Massachusetts. The next day, John noted in his diary [II, 434]: Last evening I supped with my friends, Dr. Rush and Mr. Sargeant, at Mrs. Page’s, over the bridge. The two Colonel Lees, Dr. Wisherspoon, Mr. Adams, Mr. Gerry, Dr. Brownson, made the company. They have a fashion, in this town, of reversing the picture of King George III in such families as have it. 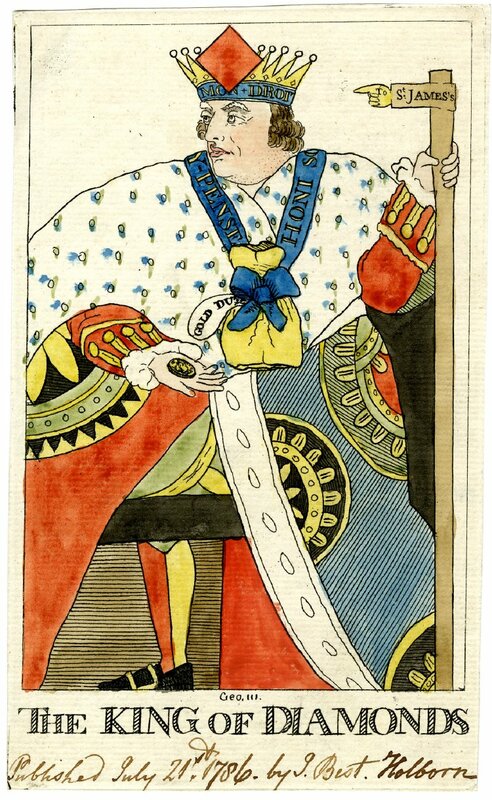 One of these topsy-turvy kings was hung up in the room where we supped, and under it were written these lines, by Mr. Throop, as we are told: Behold the man, who had it in his power/ To make a kingdom tremble and adore, Intoxicate with folly. See his head Placed where the meanest of his subjects tread. Like Lucier, the giddy tyrant fell; He lifts his heal to Heaven, but points his head to Hell. Well I like this “fashion”, and can certainly think of one or two people I’d like to turn upside down at the moment. I’m sure we all can. Apologies to my British friends: I couldn’t find an image of a Baltimore dining room with a topsy-turvy portrait of King George, so I simply turned him upside down myself. But we must note that like so many of their revolutionary sensibilities, the new Americans were simply following a British example: in this case the “world turned upside down” sentiments of the English Revolution in the previous century. The leader of that revolution, Oliver Cromwell, was himself turned upside down when an Indian monarchist of the Victorian era purchased his portrait and displayed it topsy-turvy in a delayed protest of the regicide: the Inverness Museum and Art Gallery followed suit when it acquired the portrait, and Tate Britain when it exhibited it. Another topsy-turvy ruler is Philip V of Spain, whose portrait is traditionally upended in the Almodí Museum in Xàtiva, in retribution for the burning of the city at the close of the War of the Spanish Succession. The first Bourbon King of Spain, Philip V.
Later in the eighteenth century and into the nineteenth, the upside-down, topsy-turvy motif was mostly used in a satirical or critical way, the point having been established: “it is monstrous that the feet should direct the head” (in the words of my favorite queen, Elizabeth I, to make up for turning George III upside down) or something’s not right here. There was also a two-sides-of-the-same-coin message in some topsy-turvy images, as well as a general sense of we’re being tossed about/PLAYED. That’s how I feel. Topsy-turvy “Talons” Kaiser Wilhelm I and Emperor Napoleon III, 1878, Victoria & Albert Museum; the Topsy-turvy Economy, 1978, Jean Michel Folon, Smithsonian/National Portrait Gallery. 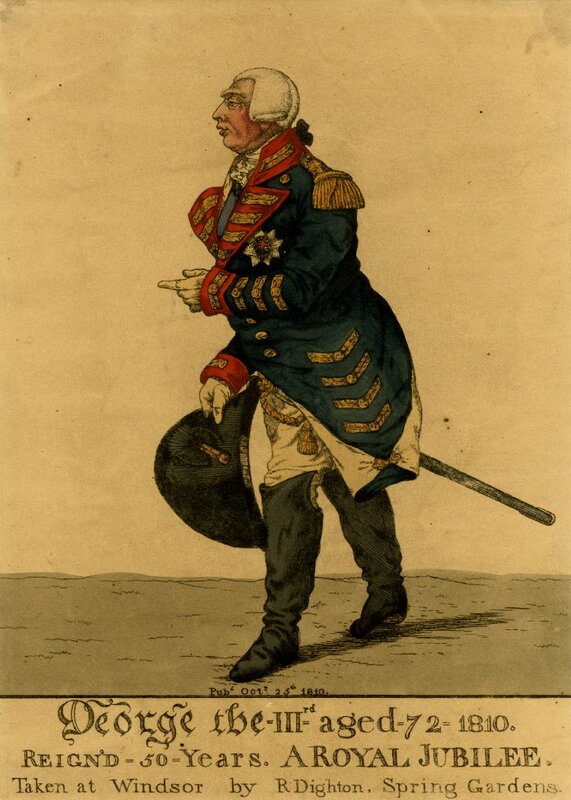 The Regency Era, that age of conflict, caricature, and couture, formally ended today in 1820 with the death of George III; as the King had been unable to rule from (at least) 1811 his son, the future George IV, served as Prince Regent. In terms of cultural history, the era really extends up to the accession of Victoria in 1837, but I’m being strictly historical here as I want to write about poor George III. Few monarchs in English history have been so maligned; I’ve always felt a bit sorry for him. In part it is because of the sheer length of his reign (he is the third-longest-reigning British monarch, after Victoria and Elizabeth II, including the regency decade) but his depictions and representations are more a consequence of what happened in that long period: war with France and America, the loss of the latter, conflict with Parliament, a huge public debt, and his own insanity–which has received the retrospective diagnosis of porphyria, a hereditary disease of the nervous system. 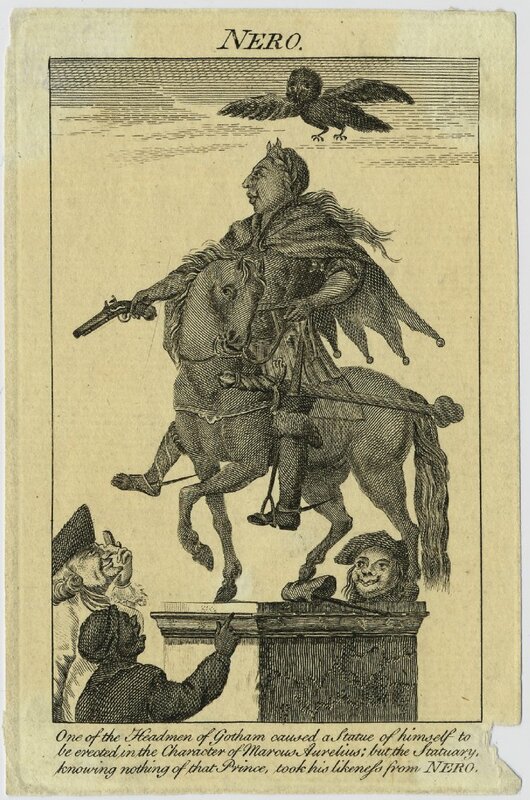 But more than all these factors, I think the increasing freedom of the British periodical press is primarily responsible for the public perception of the King, as its appropriation of the public sphere corresponds with his realm, along with the proliferation of satire and caricature. 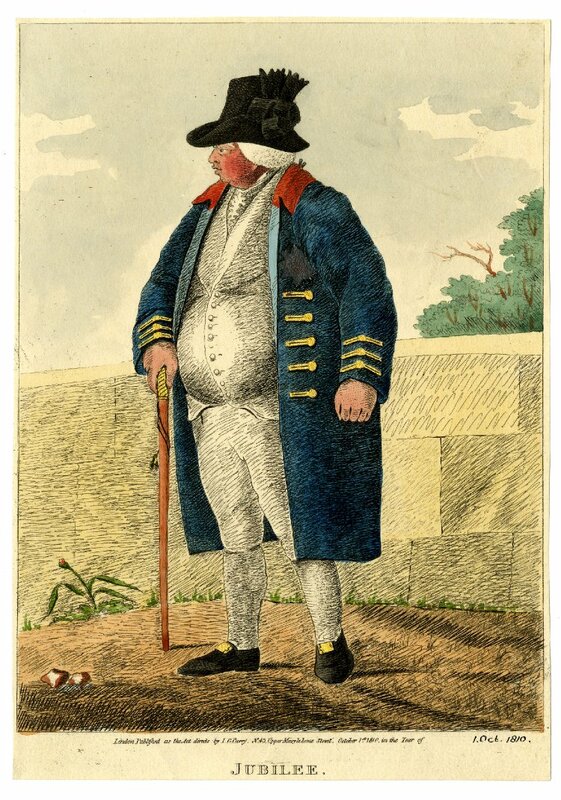 George was a perfect subject/target–chubby, gouty, and incapacitated at his worst, a rather unsophisticated “Farmer George” at his best. He is often portrayed as tyrannical and always as greedy–and these are the works of British subjects, not American or French citizens! 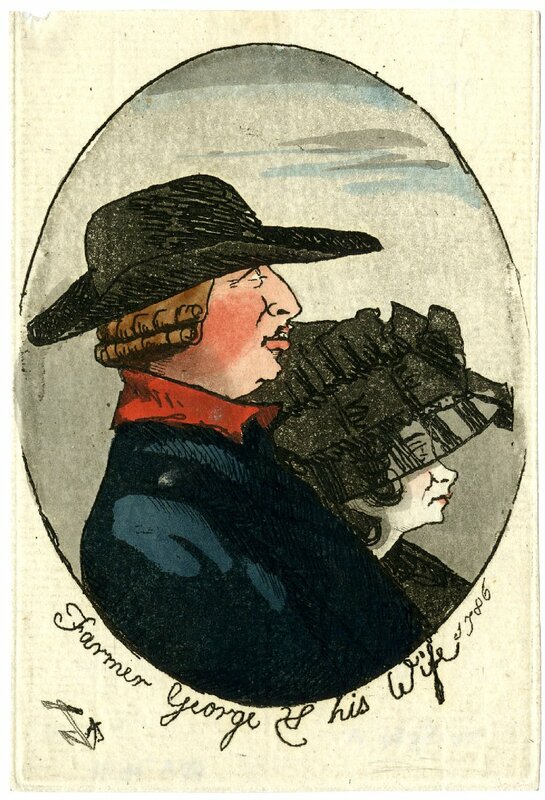 Anonymous contemporary etching of King George III; “Farmer George & his Wife”, pub. 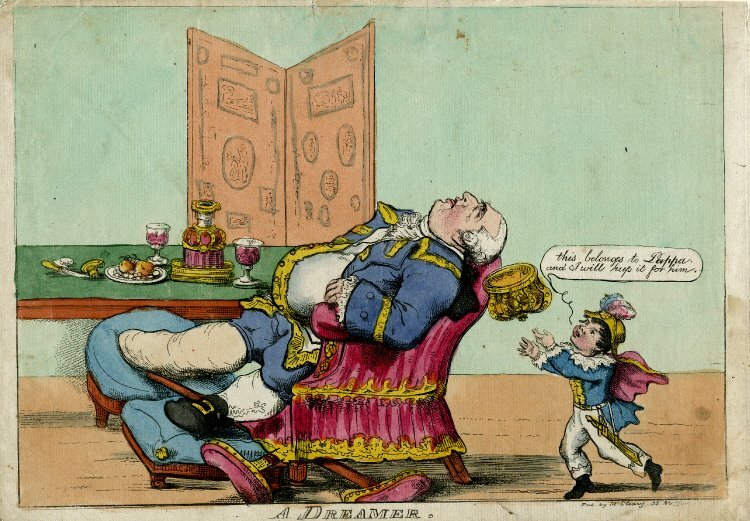 by William Holland, 1786; Anonymous hand-colored etching of the “King of Diamonds”/George III, 1786; George III as Nero, anonymous etching, c. 1760-1780; George III as a gouty “dreamer (while his son catches his crown), pub. 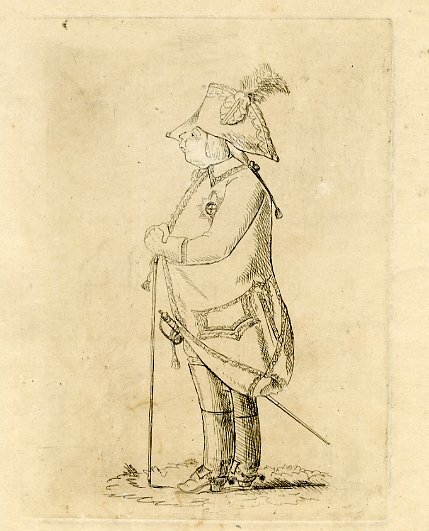 by William McCleary, c. 1805; Jubilee (1810) prints of George III by Robert Dighton and I.G. Parry. All, British Museum.